It’s that time of year again when football fans huddle in front of the television, frequent the nearest bar or attend the latest gathering to tune into one of the most anticipated sporting events of the year. Super Bowl 53 is upon us and according to the International Council of Shopping Centers, over 190 million Americans are planning to watch the Los Angeles Rams and New England Patriots battle for the Lombardi Trophy. As fans and friends prepare for game day, the festivities bring with it a slew of food traditions to round out the Super Bowl experience. According to the National Chicken Council’s annual Chicken Wing Report, the unofficial Super Bowl menu staple, the wing, is still in play! The report projects that fans will eat 1.35 billion wings during Super Bowl weekend; that’s 20 more million wings than last year. With food at the helm of most celebrations, game day brings with it big spending and big appetites. Fans are projected to spend a whopping $14.8 billion, which is the second-highest recorded spend in history according to a National Retail Federation and Prosper Insights survey. On average, viewers are expected to consume 2,400 calories, including beverages, which makes the Super Bowl the second largest day for food consumption behind Thanksgiving. Beyond the Super Bowl favorites including salty snacks, deli meats and spreads, there are several chilled dishes that tout bold flavors and eliminate hours in the kitchen. So, have you considered frozen? With tons of freshly prepared meals that are flash frozen and easily accessible at your local grocery or supermarket, frozen offers several options suitable for any crowd, including the growing number of health-conscious consumers that are still looking to enjoy those comfy treats during the Super Bowl, but without the high caloric intake. And according to Nielsen, 39% of Americans are skipping meat protein and actively trying to include more plant-based foods in their diets. With frozen, you have access to a myriad of choices when perusing the chilled aisle as you prepare for Super Bowl Sunday, whether your pursuing healthier options or not, choice and taste doesn’t have to suffer. From cauliflower dishes to add to any vegetable spread, organic spinach dips, a wide variety of turkey-based and gluten-free items to pizza, sliders, and wings, the frozen food aisle has tons of delectable treats that don’t take tons of time to make, freeing up your afternoon to enjoy every minute of the game. 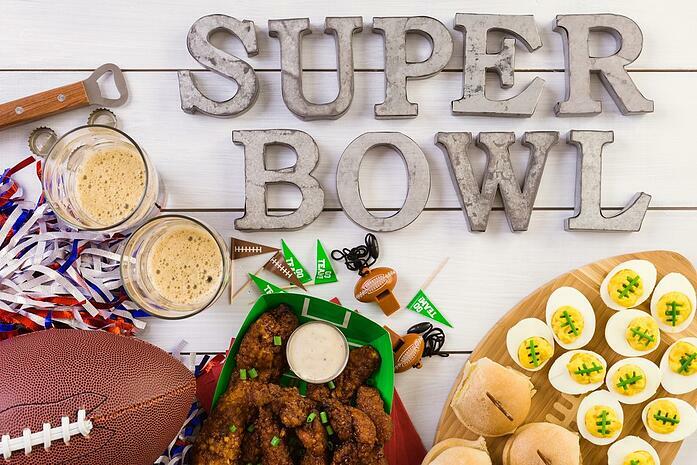 So whether you’re watching Super Bowl LIII at Mercedes-Benz Stadium, with fellow patrons at your nearest sports pub or enjoying the Bowl from the comfort of your home, it’s evident that food is at the heart of the celebration. Those comfort dishes that we enjoy while vigilantly watching the game make these sporting events memorable, whether fresh or frozen. Enjoy the Bowl! Check out these frozen recommendations for Super Bowl.